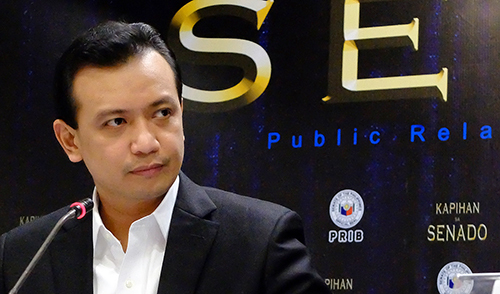 MANILA -- Solicitor General Jose Calida on Thursday said he plans to sue beleaguered senator Antonio Trillanes IV for the slanderous statements made by the latter against him. "The putschist Mr. Trillanes ranted to the media yesterday that I “stole” his amnesty application document. In effect, Mr. Trillanes maliciously branded me as a thief, which I’m not. Unless Mr. Trillanes expresses his sincere apology for calling me a thief, I shall be constrained to file a criminal case for libel plus damages against him," Calida said in a statement sent to reporters. Calida said Lt. Col. Thea Joan N. Andrade, Chief of the Discipline, Law and Order Division of the Office of the Deputy Chief of Staff for Personnel (J1), who is the custodian of the records, earlier issued a certification that there is no available copy of Trillanes’ application for amnesty in their records. "I have never entered the offices of the J1 or the Personnel Division of the AFP at Camp Aguinaldo so how could I “steal” documents kept there?" the top government counsel said. "Apparently, Mr. Trillanes did not bother to read with perspicacity the Proclamation No. 572 series of 2018, concerning the revocation of the DND Ad Hoc Committee Resolution No. 2 (#1) dated January 31, 2011 insofar as it granted amnesty to him," he added. Earlier reports said Trillanes failed to comply with two minimum requirements for the grant of amnesty. In particular, he did not file an Official Amnesty Application Form and the sworn statement or narration of his participation in the Oakwood and Manila Peninsula incidents which was required to be annexed to his application. Calida noted that the lawmaker likewise did not express his guilt for his participation in the Oakwood coup d’etat and the Manila Peninsula siege.